Soak the gelatine in a little cold water for 10 minutes, then squeeze to remove the excess water. Put in a bowl, cover with 100ml boiling water and stir until dissolved. Transfer to a jug. Mix in the cordial and 225ml cold water. Meanwhile, wash and strip the redcurrants from their stems. Pat dry on kitchen paper. Wash, hull and dry the strawberries. Slice half, (the others shouldn't be sliced until needed, (then cut thin slices of nectarine away from the stone, dropping them into the liquid jelly to prevent them discolouring. Put a few redcurrants in each of the 6, 200ml wine glasses, followed by a few nectarine slices and a few strawberry slices. Pour in enough liquid jelly to barely cover them - the glasses should be about half full. Transfer to the fridge until set - about 1½ hours. The jug of remaining jelly should remain at room temperature to keep the jelly liquid. 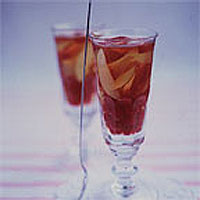 Once the glasses are set, layer the remaining fruit into them and fill with the remaining liquid jelly. Chill until needed.